There are hundreds of conveying applications those requires light duty conveyor belts to make the conveying process effective and low cost, owing to the colossal requirement of the light duty conveyor belt, we as a manufacturer of the PVC conveyor belt have specifically designed a light duty range that is intended to serve all the light duty application requirements unfailingly. 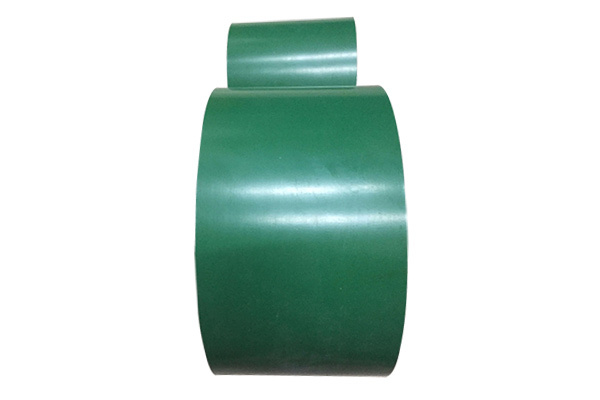 This light duty PVC conveyor belt is a simply a conveyor belt with the precise coating of the exemplary quality PVC material. All together the technological prowess and banking of the cutting edge facilities have enabled us to design and develop the light duty PVC conveyor belt of the highest quality standards that flaunting customers from the every industry by means of high strength, greater abrasion resistance, chemical resistance and antistatic characteristics. The conformity of our light duty PVC conveyor belt to the ISO standards, exhibits its high safety and reliability quotients, is an outcome of our strict checking against quality standards, followed by the dimensional engineering. Moreover, it also conforms to the FDA health regulations, hence is safe for a variety of food applications, makes it enormously favored conveyor belt for accomplishing light duty product conveying at low cost. The catalog of our light duty PVC conveyor belt accounts different size, compounds, colors, patterns and cover profile, each shares highest quality standards and made to outlast generations. Other than, we also provide cleats, side walls and guides with the conveyor, if required. Packaging, sorting, rounding, handling, slicing, cutting, dividing, oven takes off, cooling, sterilizing, washing, draining, whatever your requirement is, our light duty PVC conveyor belts are promising to perform any of the operations efficiently without any downtimes and help increase your productivity at the end of the day. We as a light duty PVC conveyor belt manufacturer have already served paper, letter, detergent, spare parts, carton, tobacco, fruit, vegetable, food packaging, cheese processing, confectionery, meat, dough processing industries, and acclaimed for the unmatched quality servicing, lower downtime and higher productivity. Are you looking to replace your belt or looking for the new one, our PVC conveyor belt can be the truly worth solution for you. Excellent against abrasion and hence best for cutting, slicing, etc.